Every week, I see all kinds of food and restaurant related articles. These are my favorites that made the cut! I've never liked well done meat, for any reason. I've always thought anything over medium is over done. For me, the meat gets dried out and all of the flavor cooks out after that. Now there it looks like there is some science to back that up! 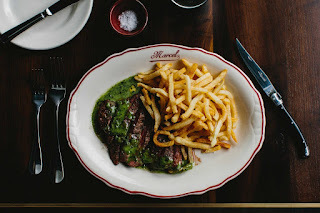 L’Entrecote at Marcel, Served with Sauce Verte and Frites. coffee shop sound like they're just what I would need to go see! And that steak at Marcel's, makes me want to pack up and head over right now! There may not be anything better than a fish fry on a Saturday afternoon. Friends hanging around the backyard with a cooler of drinks, waiting on that delicious fish to come out of the oil! Here, Kim Severon gives us a perfect twist on a classic!